– Turn the light switch to AUTO ⇒ fig. 54. – Turn the light switch to position . – Turn the light switch to position O. When the switch is set to AUTO, the headlights switch on automatically according to the ambient light conditions, for instance in a tunnel, at sunset, or in the rain or snow. The ( symbol lights up when the dipped headlights are on. The headlights are switched on, regardless of the light conditions, when you switch on the fog lights. The headlights are switched off automatically when you switch off the ignition. 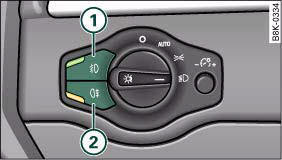 On vehicles with a rain sensor, the headlights switch on automatically after several windscreen wiper cycles. The instrument lighting does not switch on, however. While using the automatic headlights you can activate the main beam headlights as normal if this function has been activated in the MMI. However, if you switch on the main beam headlights while using the AUTO function and then do not switch back to the dipped headlights setting, only the dipped headlights will come on the next time you switch on the AUTO function. To be able to use the main beam headlights again you must first pull the main beam lever back to the "off" position and then push it forward to "on". For safety reasons, the dipped beam headlights will then be switched on permanently when the light switch is set to the AUTO position. However, you can still switch the lights on and off in the normal way with the light switch. You should have the light sensor checked by a qualified workshop as soon as possible. The automatic headlights are only intended to assist the driver. The driver must always ensure that the headlights are used when required, and may have to switch them on manually when the light conditions or visibility are poor. For example, the light sensors are not able to detect fog. Therefore, you should always switch on the headlights in these conditions and when driving after dark. • The light sensor for automatic headlight control is located in the mounting for the interior mirror. Do not affix any stickers on this section of the windscreen to avoid malfunctioning of the sensor. • Some of the settings for the exterior lighting can be adjustedgggggg 59. • If the lights are left on after the key has been taken out of the ignition lock, a buzzer sounds when the driver's door is opened. • The use of the lighting described here is subject to the relevant statutory requirements. • The coming home/leaving home function is active only when the light switch is set to AUTO. – Press button 1 ⇒ fig. 55 to switch on the front fog lights . – Press button 2 to switch on the rear fog lights . The side lights or headlights must be switched on. The green diode at the edge of the switch lights up when the front fog lights are switched on. When the headlights are set to AUTO, the dipped headlights are switched on automatically when you switch on the front fog lights. The headlights or side lights and the front fog lights must be switched on. The yellow diode at the edge of the switch lights up when the rear fog lights are switched on. If you are towing a trailer or caravan equipped with a rear fog light on a vehicle with a factory-fitted towing bracket, only the rear fog light on the trailer or caravan will light up. To avoid dazzling the traffic behind you, the rear fog light should only be used in accordance with statutory regulations. You can change the settings for these functions on the sound system or MMI*. – Select: Function selector button CAR > Exterior lighting. The coming home function lights up the area round the vehicle after dark when the ignition has been switched off and the driver's door opened. This function can be set to operate for a time interval between 0 (off) and 60 seconds. The coming home function is operational when the light switch is set to AUTO. 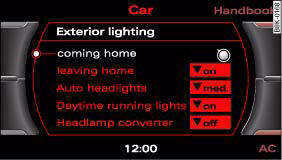 The leaving home function lights up the area round the vehicle after dark when the vehicle is unlocked. The function can be switched on or off as required. The leaving home function is operational when the light switch is set to AUTO. The sensitivity of the light sensor (i.e. how soon the lights are switched on) can be adjusted. The daytime running lights are switched on and off together with the ignition. On vehicles for some markets the daytime running lights cannot be switched off if the vehicle has halogen headlights. The asymmetric low beams of the headlights are designed to light up the near side of the road more intensely. If you drive a right-hand drive vehicle in a left-hand drive country, or vice versa, you will dazzle oncoming traffic. Vehicles with xenon headlights*: The headlamp converter should be switched on to avoid dazzling oncoming traffic. Vehicles with halogen headlights: Opaque stickers should be applied to certain parts of the headlight lenses. For further information, please consult an Audi dealer or other qualified workshop. 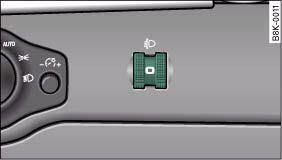 The background lighting of the instruments, the centre console and the display can be adjusted as required. – Briefly press the knob to release it. – Turn the button clockwise +” to increase the brightness of the instrument lighting in dark conditions. – Turn the button anti-clockwise -” to reduce the brightness of the instrument lighting in dark conditions. – Press the knob in again to prevent the setting from being changed unintentionally. The instrument lighting (dials and needles), the centre console illumination and the illumination of the displays are regulated by a light sensor incorporated in the instrument cluster. In bright conditions any changes made to the brightness of the instrument lighting have no effect. 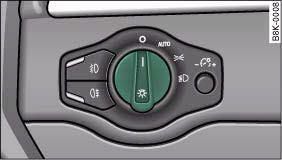 The instrument lighting (illumination of dials and needles) is switched on when the ignition is on and the vehicle's lights are off. The instrument lighting is dimmed automatically as the daylight starts to fade; it is switched off completely when the light conditions become very poor. This function is intended to remind the driver to switch on the dipped-beam headlights in good time when light conditions become poor. When the dipped beam headlights are switched on, the range of the headlights can be adjusted to suit the load being carried. – Turn the thumbwheel ⇒ fig. 58 to the appropriate setting. Always adjust the headlights to avoid dazzling oncoming traffic. Make sure you lower the headlights when the vehicle is carrying a heavy load. Headlights with xenon gas-discharge bulbs automatically adapt to suit the load being carried when the engine is switched on. The headlights are also automatically adjusted when the vehicle is in motion (e.g. when accelerating and braking). This feature provides better illumination when you drive through a corner. 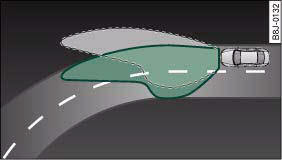 The adaptive light gives better illumination of the bend and the side of the road when driving through a corner ⇒ fig. 59. The adaptive light is controlled automatically, depending on the speed of the vehicle and the steering wheel angle. The headlights are regulated automatically when you drive through a corner, depending on how far you turn the steering wheel. To avoid having a dark spot in front of the vehicle the two headlights are directed at different angles. The system is active at speeds from approximately 10 km/h to 110 km/h. The hazard warning lights are used to make other road users aware of your vehicle in hazardous situations. – Press the switch to switch the hazard warning lights on or off ⇒ fig. 60. All four turn signals flash simultaneously when the hazard warning lights are switched on. The two turn signal indicator lamps , - and the indicator lamp in the switch will flash at the same time. The hazard warning lights also work when the ignition is switched off. The hazard warning lights come on automatically in the event of an accident in which an airbag is triggered or in the case of an emergency stop (full brake application). • If your vehicle is being towed away, or if you are towing another vehicle. The turn signal and main beam lever also operates the parking lights and the headlight flasher. – Move the lever all the way up to indicate right, or all the way down to indicate left ⇒ fig. 61. – Move the lever briefly up or down just as far as the point of resistance and then release it: the turn signals will flash three times. – Move the lever up or down just as far as the point of resistance and hold it there: the turn signals flash for as long as you hold the lever. – Press the lever forward to switch on the main beams. 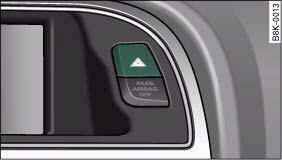 – Pull the lever back towards you to switch the main beam headlights off again. Headlight flasher – Pull the lever towards the steering wheel to operate the flasher. – Move the lever up or down to turn on the right or lefthand parking lights respectively. • The turn signals only work when the ignition is switched on. 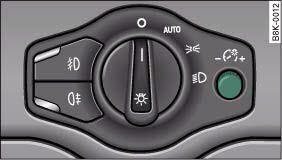 The corresponding indicator lamp or flashes in the instrument cluster. 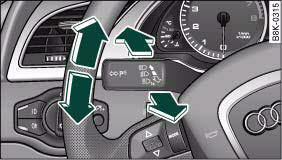 • The turn signals are cancelled automatically when the steering wheel is returned to the straight-ahead position. • The main beam headlights can only be switched on if the dipped beam headlights are already on. The main beam headlight indicator lamp then comes on in the instrument cluster. • The headlight flasher comes on for as long as you pull the lever – even if no other lights are switched on. The main beam headlight indicator lamp then comes on in the instrument cluster. • When the parking lights are switched on, the headlight and the rear light on one side of the car light up with reduced intensity. The parking lights will only work with the ignition off. A warning buzzer will sound for as long as the driver's door is open. Do not use the main beam headlights or the headlight flasher if this would dazzle oncoming traffic.